An experiment performed in the John B. Pierce Laboratory (USA) demonstrated the purpose of adequate heating: people in the room with air temperature of 50 degrees Celsius and cold walls were freezing heavily, while in the room where the air temperature was only 10 degrees, but the walls were heated, people were sweating. 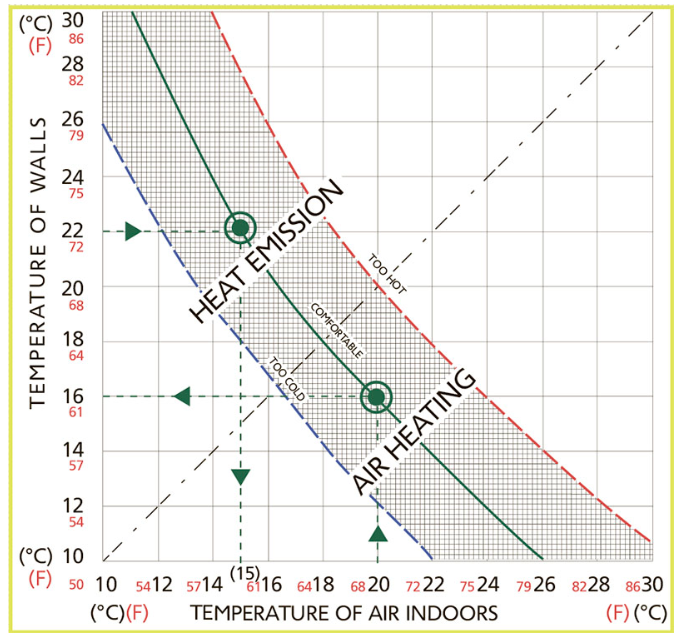 Heat emission absolutely differs from convector heating, particularly by the fact that it implies no heat exchange. No heat transferring medium (such as air) is required for heat emission, and it does not depend on the air temperature indoors. The concept is the same as with infrared sunlight – it converts into heat as soon as the light reaches the skin. The temperature of floor surface, walls, ceiling and objects in the room increases and gives the accumulated heat back to the room. Therefore, the floor and ceiling are heated almost equally at room temperature. There is no air circulation (convection). The relative air humidity stays almost the same. So, no more dry dust particles. As a result, the temperature inside the room may drop by 6-8 degrees (a drop by 1 degree is about 6% heat economy! ), but the subjective sensation of heat remains the same.